I was not comfortable with the research phase of this composition. 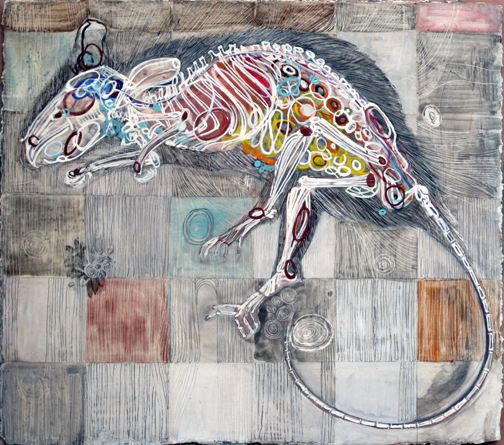 And now that I am almost done, I wish I’d painted an alive looking rodent (as opposed to a dead looking one). I loved discovering the small clavicles, the little shoulder blades. and the delicate rib cage. Every summer I make time, usually 5 consecutive days, to complete one small composition a day. I work from morning to evening. I like the intense practice that gives way to creative solutions. I never know how things will turn out, but I determine to complete a composition that balances and appeals to my eye – and to do so rather quickly. By the end of the week, I have a series of little artworks. In summer’s past I’ve printed, drawn, and done collage. This time I paint. It’s not a week of work though, it’s going on over a month at this point. I will have 6 small paintings on paper instead of 5. I am working steady and quick but this particular time the process requires a different pace. It’s varies because I am working a bit larger than usual. I work the front and back of a prepared sheet of paper. The images on each side connect, and I’ve decided material and color have to compliment. I make the egg tempera palette a little different for each panel. Drying time is part of every step. The running themes are the cat (or connection to a cat) and anatomy study, the latter requires research. Consequently I need more than a day to complete an image. Today I’ve completed a rodent. Never confident the composition would work, I decide today I like the direction it’s taking. The image at the top of the post is the casein under-painting. I finish below – with egg tempera. I planned to only make 6, I need the other side of this paper to complete that intention. But it’s possible I may continue and finish a few more, the challenge appeals to me. I’ve completed a set of His and Hers pelvic girdles. The works are studies, abstracted and detailed, 13″ x 13″, casein on canvas paintings. The composition begins very simple and then gets very complex…. there’s a lesson in here somewhere. I hope these works in some small way cause you to take care – of yourself and our world. We are so intricately connected. Below is a very short video I put together showing various process steps in of the making of His. It’s less than 2 minutes long, and it shows the work in its accurate color. I posted these black and whites, because I really like the detail that shows up. And because I am considering something to display them this way as well. To see read about Hers and access the video link → click here. two slow days on the sketch. though not exactly symmetrical, nothing is. pushing and pulling, drawing in and drawing out. On my last dental visit I conversed (albeit awkward) with Melissa, the dental hygienist who cleans my teeth. She asked what I did for a living. What sort of subject-matter do you draw? When I told her, she wondered if I might like a copy of my x-rays. She pulled them up again, identified details, gave me extra info about teeth, nerves, and pointed out the sinuses. The string-like shapes fascinate me. The head and neck areas are really interesting, she noted. When the dentist came in he told me about the varying structure of the tissues of the body. He expressed the value in drawing for the purpose of learning. He’s correct, I know. A few years back, I was invited to the Barrows Neurological Institute, here in Phoenix. It was a turning point for my work. I saw slides of fluid and body … stuff. Things appeared as solid black ground, with bright shapes and strings floating through it. I learned that the bright colors were not natural. They were injected ink, so one could see the matter: cells, both good and bad, and yes … cancer. They appeared as worlds of silence and wonder, what I might imagine outer space like. While there I ran into someone else I knew. She invited me into her lab and showed me DNA sequence. Since then I’ve purchased many anatomy books and taken anatomy classes. I’ve really looked at and studied the body and it’s parts (both eastern and western studies). It’s not a machine which I sometimes liken it to…it’s soft, vulnerable, intricate working and so perfect in its design. Who created this? – I still wonder. Today I am in Dr. Richard Shindell’s office. He is a leading valley Pediatric Orthopedic Surgeon. He’s married to artist Mary Shindell. To say Rick’s an interesting guy, is an understatement. They met in art school of all places. I can tell you about furniture he’s built for the Roosevelt Row galleries. My husband can tell you about the hot rod cars Rick builds. Here – go to his website bio – and read about him yourself. His talents are many. He’s a fine surgeon and quite respected. I’m here to see x-ray light boxes he has available for sale. Roy Wasson Valle print (you know…Fuzzy Balls) in it. A Shindell in the background. Patient rooms are brightly colored and filled with original works. I need to focus. And I sort of do – in what appears to be the x-ray room. I’ve considered painting the back body. I’m not certain it’s visually all that interesting. Mary disagrees. She shows me these framed x-rays. They catch my attention. The spinal column holds great visual rhythm. The kidneys show up from behind, quiet and subtle. Rick’s office holds extraordinary things. Though, not so extraordinary if you work with the bones of the body. I see the feet and I think of being grounded and having support. I want to do a drawing focusing on that stuff. How many people do you know, that have a pelvic girdle sitting on their desk? I want it. The pelvis has such elegant contour, and holds beautiful form. After all the visual stimulation…we get to the light boxes. That’s why I’m here after-all. They’re cool. I’ll plan to have a bit more of that part of the visit in our [Creature, Man and Nature] blog. Right now…I have to file this afternoon into my brain. It’s too valuable. In the midst of all this, Mary and I see a collaborative opportunity. We need to see what Carolyn thinks. Sketch ( from Greek σχέδιος – schedios, “done extempore”) is a rapidly executed free-hand drawing that is not intended as a finished work. Studio visit. Curator drew out this sketch. Will revisit this photo in September to see how close to the real thing we got. I met Crista Cloutier in 2000 when the Hispanic Research Center of ASU commissioned me to create a lithograph. At the time, Crista was the director of Segura Publishing where I showed up everyday for one very productive and exciting week plus, to work with their crew and with master printer Joe Segura. She also directed their gallery. I admired her ease and professionalism. Crista, actively involved in the contemporary art world throughout her career, is also internationally recognized as a writer, curator, and artist. She’s collaborated in the creation of artwork with some of the most significant artists working today. Much of the work exists in major collections throughout the US. In the last few years I’ve connected with Crista via Facebook because today she moves between England, France, and the U.S and contributes to publications such as Huffington Post, The Guardian UK, and You Magazine. …and guess what…Crista will be at Modified Arts, just after the new year. She’ll be teaching The Writer’s Life Workshop. The Writer’s Life is a two-day workshop for both established and aspiring writers. This unique class will help participants find their voice, hone their craft, and create meaning in their life and work. Students will learn how to connect to their imagination as well as identify personal vision and attain their professional writing goals. …then the workshop is for you! *Discount registration if you sign up by January 1st or bring a friend!